Second Floor Condo located on Little Sabine Bay. End unit up one flight of stairs. Boat parking available on condo association's private beach. Condo is 400 feet from Gulf of Mexico across the street, but is actually located on Little Sabine Bay which is protected water which is safer for non-advanced swimmers and water waders. Free May to October trolley service for all of island points of interest is located in front of condo parking lot. 1 covered parking spot for unit and additional parking available. Queen bed located in bedroom with a queen sleeper sofa (with inflatable mattress for maximum comfort) in the den. Blow up mattress also available for additional sleeping. Moderate selection of easy reading fiction books from popular authors. Great view, right on the water. Beautiful Beaches and Sunsets await! Very nice location, best unit for sunsets, clean. Not a glitsy glamor flat. Nice, simple, effective vacation rental. Great people in the building. Oysters at Peg Leg's are the best! It needed some repairs but the owner wasn't aware . He bought parts & started repairs immediately. The owner was very nice to work with. Although the weather was cold we had sun on the balcony & enjoyed watching the ducks & pelicans. The pots & pans need to be replaced . The internet was out for several days and our cell phone would only take incoming calls. Mediacom got the internet working but not the phone service. Television reception was very good. We had to leave 2 weeks early due to illness. Loved the location. It’s an easy walk across the street to the Gulf. Nice water view from the condo. The owner was quick to respond. I would stay here again! The location of this condo is great for proximity to food and walking; within walking distance to beach. 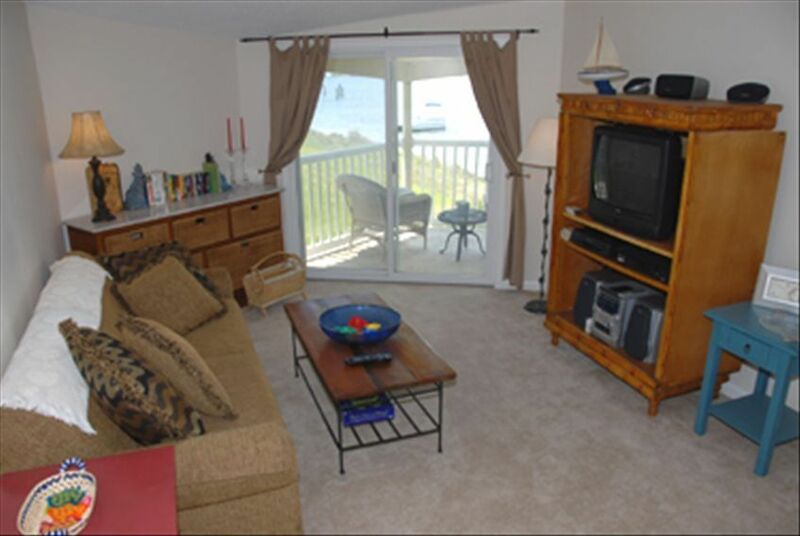 They bay view is also nice, but there is no 'beach' on the bay side at the location of the condo. We've stayed in other condo's and hotels with-in the same proximity for several years now in Pensacola. This condo has the basics and nothing fancy. Could use some updating and repairs. The iron was missing and the ironing board didn't stand properly; we never received a replacement, just an excuse from the owner. We ended up buying one at Walmart so we didn't look like we had been packed in suitcase. We had a bad experience with pests (bugs) in this condo, and notified the owner who was planning to take care of it the same day we notified him. Overall a mediocre experience, and I doubt that I would stay at any of these units again. (It was a seemingly safe location, just not ideal for us, and I'm glad that we didn't have our young children, as they love to swim and play on the Bay side. Swimming was not a great option since there were tall grasses and not good access for playing in the Bay.). If youre looking for a basic place to sleep and shower, this unit fits the bill. The condo is exactly as advertised. It is not on the gulf, but on a tranquil estuary bay. There is two water access points, but our association can not cut the natural sea grass that is indigenous to this region. Please see pictures posted for VRBO 183211. I was never notified about the iron and there used to be one there. I don’t know if it broke or was stolen, but this tenant never informed me. They did tell me about a palmetto bug they found and I notified the association because they take care of the exterior of the units where these bugs live naturally but come in for water. They are not a sign of lack of cleanliness. This renter needs to match expectations with what they rented as advertised. My guest book is filled with happy renters who’s children enjoyed our calm waters when the gulf was either too rough or has jellyfish. Also- my unit faces west and has very beautiful views of the sunset about which this tenant failed to comment. I want everyone that stays with me to have a perfect experience and will be happy to make additional accommodations for my guests. Less than 1/2 mile from main section of beach. Free live band concerts every Tuesday at Gulf Pavillion which is only 4 minute walk from Unit. Almost directly across the street from Jimmy Buffett's Margaritaville Hotel. Free Trolley service for all of Pensacola Beach with trolley stop 300 feet from condo unit.